Thank you for the opportunity to submit these written comments on priorities identified in the Arkansas Tax Reform and Relief Task Force’s Final Report. My name is Lisa Christensen Gee and I am a Senior State Tax Policy Analyst for the Institute on Taxation and Economic Policy (ITEP), a nonprofit research group. ITEP’s research focuses on federal and state tax policy issues with an emphasis on the goals of sustainability and fairness. ITEP has testified before the Task Force on multiple occasions regarding Arkansas’ tax system. ITEP is submitting these written comments as we were unable to attend the Task Force meetings held this week in person. My written comments today focus on the “dollars and cents” of the tax policy priorities outlined in the Task Force’s Final Report, the impact these policy priorities will have on taxpayers across the income spectrum, and feedback regarding the time frame for implementing tax cuts over a period of time. 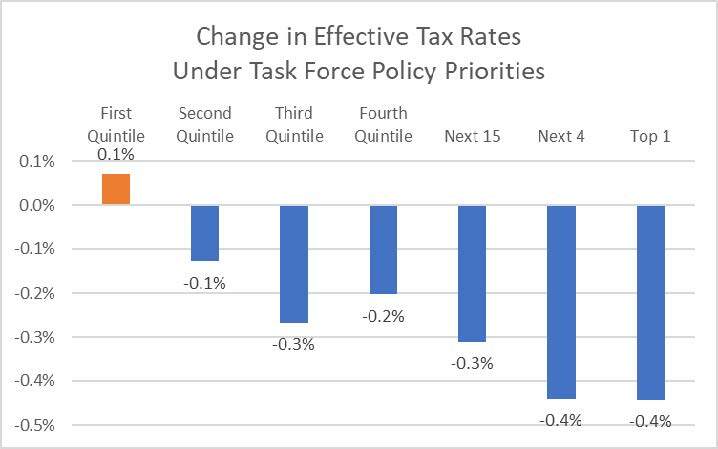 An obvious but important first observation on the priorities identified by the Task Force is that cost of these combined tax cuts far exceeds the $200 million tax cut target, equaling over $422 million in Fiscal Year 2019 terms (assumes the NOL deduction is fully-phased in FY19 dollars). These costs are only partially offset by the proposed tax policy priorities that would result in revenue increases. If all increase priorities were also enacted, they would raise only over $43 million in Fiscal Year 2019 terms, which equals only 10% of the cost of the combined priority tax cuts. As has been demonstrated repeatedly in the academic literature and in the laboratory of the states, tax cuts of this nature don’t pay for themselves. This means that even if lawmakers enacted all of the priority revenue raisers, they would have to enact over $379 million in permanent cuts to spending for other state priorities in order to balance the budget. This magnitude of budget cuts represents almost 7 percent of the state’s fiscal year General Revenue Funds. Enactment of net cuts of this size without simultaneous consideration of the direct costs—divestment in other state priorities—is irresponsible. Any tax policies enacted should be done so after due consideration of the state’s other needs, including whether the state has adequate resources to invest in education, job training, and infrastructure, how any tax cuts will impact the state’s ability to respond to looming federal budget cuts, and the state’s preparation for the next economic down turn. 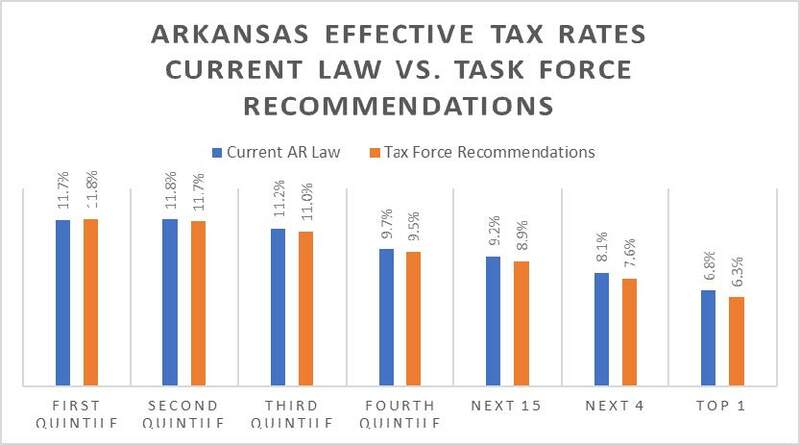 The incidence of Arkansas’ current tax law (pre-enactment of any of the Task Force’s priority recommendations) is regressive—requiring that lower- and middle-income families pay higher percentages of their incomes in state and local taxes than those with higher incomes. 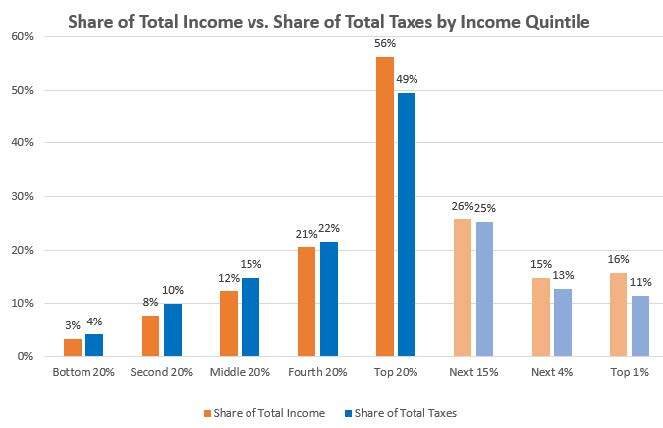 When considering the distribution of aggregate income and tax contributions by income group, the bottom 80% of taxpayers in the state—those with total incomes under $93,000—all pay more in total taxes than their corresponding share of aggregate income, whereas the top 20% pays well below their share of total income. The priority tax policies prioritized by the Task Force further exacerbate this problem by making the incidence of Arkansas’ tax system even more regressive. If all of the priority tax cuts and tax increases identified in the report were enacted, they would result in a net tax increase on the bottom 20% of taxpayers (those with incomes of $22,000 and below), while cutting taxes for those in the top 80%. This is due to a partial tax shift—raising more revenue through the sales and fuel/vehicle taxes, which are regressive in nature—while cutting personal and corporate income taxes only for high-income earners. The biggest beneficiaries under these combined plans are by far the top 5% of taxpayers—those making over $200,000 in income—who already pay the smallest share of their incomes in taxes, who pay less than their share of income in total taxes, who were the biggest beneficiaries from the recent federal income tax cuts, and who also benefitted from recent tax cuts in Arkansas intended to be targeted for low- and middle-income taxpayers. The second graph displayed below more clearly illustrates the disparate impact of these policy priorities—showing the 0.1% increase on Arkansans with incomes less than $22,000 and the 0.4% cut for Arkansans with incomes over $200,000 and $400,000 (top 5 and top 1 percent). Other substantial beneficiaries under the Task Force’s priorities are shareholders of corporations that live in other states or countries as they represent the majority of owners of corporate interests taxed in the state. These multinational and international shareholders would receive an estimated $119 million in tax cuts, 28% of the total recommended tax cuts that would be funded through tax increases on the bottom 20% and substantial budget cuts. This is a far cry from ensuring fairness to all individual and entities impacted by the tax laws of Arkansas. Any triggered tax cut should also include a mechanism automatically reversing the cut if the economy significantly declines following the tax cut’s enactment and/or if state revenues fall much more dramatically than expected. In addition to concerns about large revenue losses and agitating the unfairness of Arkansas’ state and local tax system, there are other policy grounds for opposing many of the proposed tax cuts identified as priorities of the Task Force. Increasing the Net Operating Loss (NOL) Carry ForwardMaintaining federal conformity to the federal NOL deduction will result in a revenue loss, which should be offset by increasing the corporate tax rate or eliminating other corporate tax expenditures to prevent further erosion of the corporate tax base and maintain adequate revenues for public investments. Cutting the Corporate Income Tax RateThere is no justification for reductions in corporate income tax rates. Rate reductions will impede Arkansas’ ability to invest in its low-performing education system while doing little if anything to enhance job creation or in-state investment. Additionally, a comprehensive evaluation of the evidence by the non-partisan Joint Committee on Taxation (JCT) finds that over the short term all of the benefits of corporate tax rate cuts will go to shareholders, not workers. Even over the long term, the JCT estimates that three-quarters of the benefits flow to shareholders rather than workers. The recent experience with the passage of a substantial cut in the federal corporate tax rate as part of the Tax Cuts and Jobs Act appears to confirm this insight, with companies engaging in record setting stock buybacks and dividends, while wages continue to stagnate. Repeal of the Throwback RuleA majority of states have throwback or analogous “throwout” rules in effect; there is no justification for Arkansas’ reversal of this longstanding policy.Throwback rules represent interstate cooperation to prevent corporations from having “nowhere income” that cannot be taxed by any state due to federal limitations on the authority of states to tax corporations that only make sales to state residents. Enacting Single Sales Factor ApportionmentContrary to claims stating otherwise, single sales factor apportionment has not improved the economies of states adopting it.Adopting single sales factor apportionment in a state that has not also mandated combined reporting is a prescription for serious erosion of the corporate tax base; out-of-state corporations that would otherwise have higher corporate income tax liability due to adoption of the single sales factor formula will change their legal structures to minimize the amount of their total profit taxable in the adopting state. Based on the priorities identified to date by the Task Force as expressed in its Final Report, ITEP is concerned that state tax policy in Arkansas may be headed in a direction that will undermine critical state investments, increase taxes for low-income taxpayers while cutting taxes significantly for high-income earners and businesses, and set the state up for recurring fiscal crises in years to come, all in the name of increased jobs, competitiveness, and other promised economic benefits that repeatedly come up short. Thank you for your time and consideration of these remarks.